Economy in turmoil! Businesses in crisis! The new normal for the 21st century. For a practical guide to recession survival we suggest our new book “SURVIVAL IN THE SEA OF ECONOMIC CHAOS.” Written by business executives for business executives, this book is all about timely and effective leadership actions for business stabilization and survival in a world that is continually changing due to disruptive external forces. Following is an excerpt from the book introduction that gives you an idea of what to expect. OUR SUBJECT? Perspectives on different possible actions that the leaders of businesses struggling in the midst of economy–induced chaos could take. The causes of the chaos can range from recession to political revolution to tsunami to some other major disruptive event. But that doesn’t matter. These are broad external forces beyond the control of any single business. What is important is that these forces can (and often do) have widespread economic impacts that cause crises for businesses. And these crises are likely to end in disaster without leadership intervention. So the focus of our book is business survival in difficult economic times, and we explore various leadership actions for achieving that goal. OUR APPROACH? We start by describing results–oriented actions for quickly shoring up and stabilizing struggling businesses to help them “stay afloat” and cope with the financial crises created by external forces (i.e., recession, depression, or some other significant economic disruption). Then, as the turbulence eases and the economic environment improves, tactics and strategies for longer–term business survival and turnaround in performance are explored. OUR “RECIPE” FOR SURVIVAL? There isn’t any one “best” way of coping with the types of business crises caused by economic chaos. Therefore we: 1) suggest different types of leadership actions for different timeframes, 2) provide examples and easily accessible references that illustrate each type of action, and 3) describe different leadership, methodologies, and tools for optimizing decision–making, strategic and business planning, and implementation of chosen actions. In other words, we suggest approaches and alternatives…..Then, all things considered, we leave it up to you, the business leader, to choose the path that is most appropriate for your specific situation. 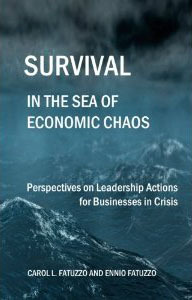 “Survival in the Sea of Economic Chaos” is available in both paperback and Kindle formats from amazon.com.